I recently came across two pictures illustrating the radical tones the feminist revolution has assumed in once-Catholic Spain and France. In both cases, what would then be considered deplorable and shocking to Catholic sensibilities is almost shrugged off today as normal. This seemed an appropriate place to share these photos with TIA readers. 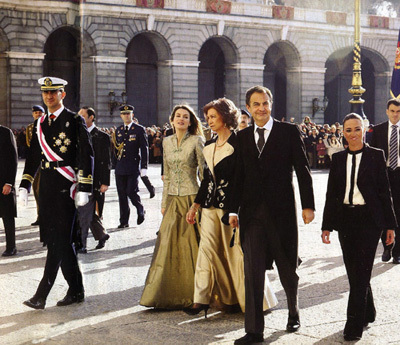 In the first picture at right, members of the Spanish Royal Family take part in the Pascua Militar parade at the Royal Palace traditionally held every Epiphany feast day. The Pascua Militar is a day when all military personnel fulfill their Easter obligation - according to the Commandment of the Church - to receive Communion at least once a year. Since it celebrates the beginning of the military year on January 6, King Juan Carlos, as General Commander of Spain’s military forces, initiates this parade by reviewing the troops. In our picture the personalities approach the platform to watch the parade, from left to right, Heir Prince Felipe marches in the Lieutenant Commander uniform of the Armada. Princess Letizia and Queen Sofía wear elegant silk jackets and skirts, following State protocol that calls for long dresses for ladies at this solemn day. Next in line in the photo is First Minister Zapatero, following the custom whereby ministers of State accompany this parade in formal suits with tails. The clash comes with the figure in the lower right. Defense Minister Carme Chacón caused a shock wave by her choice of dress, wearing black trousers, a “tuxedo jacket” and a collarless shirt stamped with a fake tie. Add to that her heavy flamenco-dancer make-up and bold expression, and you have the message: The female Defense Minister takes pleasure in mocking the norms of protocol and flaunting her revolt against tradition. She was mocking not just tradition, but also the Royal Family and the dignity of the glorious Spanish Army that she should honor. At least some officers were quick to point that out. General Mariano Casado said it seemed reasonable to ask the Minister for Defense to respect the rules, because the Army is based precisely on discipline and the compliance of norms. Her behavior was not a good example, he concluded. Protocol is based on certain conventions regarding dress and behavior that serve to guarantee the solemnity or etiquette of established acts. It preserves the respect for authority and the high tonus of royal ceremonies. The outrageous gesture of the socialist Minister of Defense had far greater significance than some might think. It expressed the revolutionary spirit of a radical feminism that wants to destroy tradition, mock the feminine elegance of the past and replace it with a revolted pretension to be equal to men. The second picture at right shows a woman in a black suit with her newborn daughter bundled in white swaddling clothes. Five days after giving birth, this Supermom was back at the office in her stiletto heels and tight black suit for the weekly Cabinet session. No maternity leave needed for French Justice Minister Rachida Dati. In fact, this feminist doesn’t even need a father for her daughter. For the last nine months she has brazenly flaunted her pregnancy, despite being a single woman. Her refusal to name the father of her unborn child has triggered a barrage of speculation. In the tiresome Dati soap opera, the real point of the drama was missed. We witnessed a top government official in supposedly Catholic France who not only defiantly became a single mother, but went so far as to deny her daughter a father. Spurning the natural order of the family established by God, His Commandments and the principles of Catholic Morals, the French Justice Minister acted as an anarchist. Ms. Dati can do everything and be everything. What kind of example is this? It can only encourage extra-matrimonial adventures among young women. I deeply lament that, as far as I know, the French Catholic Hierarchy did not say a word of protest against the scandalous behavior of Rachida Dati. I have a great pity for that poor child who begins life in such unnatural and unfortunate circumstances. And I am very sad for Catholic France, whose sanctity and greatness used to rest on the well-constituted family. I believe Rachida Dati has failed miserably. Her government at the Justice Ministry is so inept it is openly called disastrous. And her bad example for women and scandalous morals sinks her country even deeper into the abyss.